Ericka established Grills Gone Wild in 2005. She had been doing small catering jobs for her friends for a couple of years prior; however, the response she received was overwhelming and she needed to be able to cook for more people. Ericka designed and had a trailer built which she felt would fit her catering needs. After a lot of long hours and hard work, she has her trailer and is ready to cater your event. Ericka loves to cook and spends a lot of time perfecting her recipes at home before she will add them to her menu. Everything on the menu is homemade, from the appetizers to the desserts! No salad mix out of a bag or desserts from another restaurant. All of the meats served by Grills Gone Wild are smoked using either your choice of Mesquite, Apple or Oak wood. 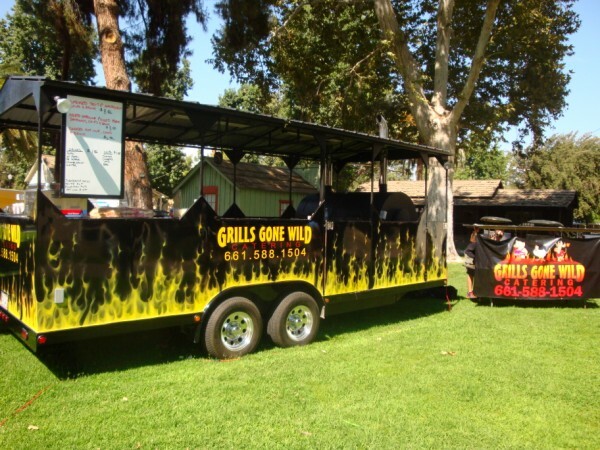 Grills Gone Wild has catered events for as few as 20 people to as many as 3500. Ericka designed her trailer so it is totally self-contained and she can take it to cater your event anywhere. She has traveled as far north as Sacramento and as far south as San Diego. She can go to the beach or to the desert and be able to serve you the best gourmet BBQ around! Whether you event is large or small, want your meal cooked on-site or delivered, give Ericka and Grills Gone Wild a call and let her design your Custom Gourmet BBQ menu!! !